This was my first visit to SENA. I don’t have the hindsight of previous visits, but I suspect that we are seeing a quiet revolution in the world of aquaculture, led by land-based farming entrepreneurs who are finally succeeding with this model of fish farming. One of the most intriguing visits I did at SENA was to the stand of Hudson Valley Fish Farm. Entrepreneur Sam Chen had his steelhead fish harvested at 4am that morning, and trucked over from the farm site near near Albany in NY state to Boston. They looked exceptionally fresh, and made the advantages of recirculating aquaculture systems (RAS) farming all too obvious. What was striking was the diversity of fish on offer, and species that might not have been available a couple of years ago. Take Dyer Aqua, a farm in Panama’s Bocas del Toro estuary that is now churning out farm-raised pompano. The Dyer team had been working on raising Florida pompano, a popular fish and convenient for cooks with its even thickness fillets, since the 1990s. Their Florida farm was destroyed by a hurricane a few years ago, and the innovators found a similar tropical climate but less exposure to hurricane weather in the southern reaches of Central America. Now, they’ve finally cracked it. Land farming, however, was a big theme at the show. Kingfish Zeeland, which has built a huge yellowtail farm in the Netherlands, announced to me that they will build a plant on US shores. Read the Undercurrent News story here. I traveled to Maine to inspect the future sites of land-based salmon farms. Now for the behind the scenes stuff. 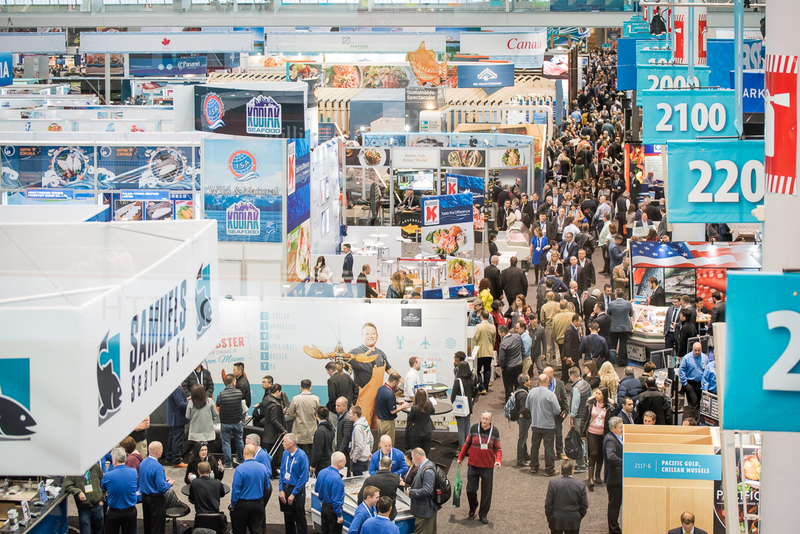 Firstly, it is hugely tiring tearing around between meetings at the 516,000 square feet Boston Convention and Exhibition Center. Going from the exhibition stands to the adjoining Westin Hotel can be a 20-minute indoor walk. Being able to do walks indoors of course was a big bonus this week, as a fierce nor’easter dumped a foot of snow on Boston and closed down most of the city. The show kept going valiantly through the storm, although a few executives, especially those familiar with the harshness of the weather in the U.S. Northeast, changed their flights and got out of town before the worst of it. I’m looking forward to coming back next year!